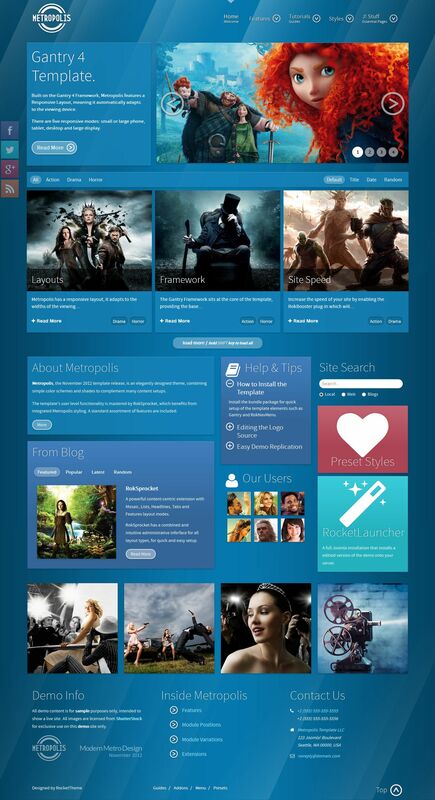 RT Metropolis - elegant template Joomla 3.0 with support from the design studio RocketTheme. This template is built using all the latest technologies that are included in the updated framework studio Gantry. Flexible display of information on the site is provided through the use of functional extensions for working with content RokSprocket. Design template has adaptive layout, supportive and responsive to the touch of your fingertips on mobile and tablet devices. The template includes a new CSS drop-down menu, which offers advanced features such as multiple columns, built-in icons and additional text for the menu items. In the assembly includes the best expansion studio: RokNavMenu, RokSprocket, RokPad, RokCandy, RokAjaxSearch, RokBox and RokBooster, as well as added support for the popular component K2. RT Metropolis is the best solution for creating websites gantry.